The BOEM Meeting scheduled for January 17, 2019 at the MV Hebrew Center will be postponed due to partial government shutdown. "If the federal government shutdown continues into the morning of January 14, the meetings scheduled for January 15-17 will be rescheduled." Vineyard Power encourages the public to submit comments online for both the BOEM Draft Environmental Impact Statement as well as the Final Environmental Impact Report submitted to the Massachusetts Environmental Policy Act Office. Instructions to submit comment can be found here. BOEM continues to accept online comments during the shutdown. Check this page for the next steps in the Vineyard Wind permitting process, and the latest information about public agency meetings and opportunities for public comment. For any questions regarding the permitting process, please email Erik at erik@vineyardpower.com. Using the Federal eRulemaking Portal: http://www.regulations.gov. In the search box, enter BOEM-2018-0069, and then click "search." Follow the instructions to submit public comments and view supporting and related materials available for this notice. In written form, deliver by hand or by mail: Enclose comments in an envelope labeled “Vineyard Wind COP Draft EIS" and provide to the following address: Program Manager, Office of Renewable Energy, Bureau of Ocean Energy Management, 45600 Woodland Road, Sterling, Virginia 20166. Before including your address, phone number, email address, or other personal identifying information in your comment, you should be aware that your entire comment, including your personal identifying information, may be made publicly available at any time. Vineyard Wind has submitted its Final Environmental Impact Report (FEIR) to the Massachusetts Environmental Policy Act (MEPA) office. Public comment to the FEIR should be submitted by January 25, 2019. The United States’ Bureau of Ocean Energy Management (BOEM) has announced that it will issue a Notice of Availability (NOA) for Vineyard Wind’s Draft Environmental Impact Statement (DEIS.) The DEIS was prepared by BOEM as part of the agency’s review of Vineyard Wind’s proposed 800-megawatt (MW) wind farm to be constructed in federal waters south of Martha’s Vineyard and approximately 34 miles south of the Cape Cod mainland. What is the BOEM’s Draft EIS? A Draft Environmental Impact Statement (DEIS) is a draft document that describes the project’s effects on the environment. The purpose of the review is to ensure the technical accuracy of all aspects of the document and offer an opportunity for the public to comment. You can learn more about BOEM’s Environmental Impact Statement (EIS) Process here. What type of comments does BOEM consider? Sociological concerns such as changes in population or demands for public transportation, education, or health care services. When can the public provide comments? There is a 45 day public comment period on the Draft Environmental Impact Statement (DEIS) for the project. The public comment period ends January 21, 2019. The public may either comment to in writing or by making oral comments at one of the public meetings. Additional information on Vineyard Wind’s DEIS can be found at BOEM’s website. Public meetings will be held during the comment period at the following times and locations. Please note these meetings are not hearings. It is not necessary to attend a meeting to provide comment, and any comments received during a meeting will be treated by BOEM the same as comments made in writing per the directions above. During Thursday’s Senate debate on S.2545, state Senator Julian Cyr offered a “Community Empowerment” amendment (amendment #22, which was unanimously adopted) that would allow municipalities the ability to enter into long-term renewable energy contracts, and provide financing for such projects, on behalf of their residents and businesses. Before entering into any contract, the municipality must have the support of the community through a democratic process, such as a town meeting vote, followed by a public process to choose the renewable energy project, which would include either boards of selectmen, town councils and/or the community electric aggregator. Once the renewable energy project is operational, electricity customers in that municipality would see savings on their bills. “Vineyard Power Cooperative and their membership are appreciative to Senator Cyr and his staff for their leadership and execution in achieving this milestone and getting this legislation passed in the Senate. We believe in the power of local choice and local empowerment that enables our community to take control of our energy future and will help ensure our community vision of being carbon neutral in home heating, transportation, and domestic electricity by 2050. This is a big win for not only our local island community, who is sitting in the front row to see the effects of climate change and sea level rise, but also for the region and for the Commonwealth,” said Erik Peckar, General Manager of Vineyard Power, the organization who helped craft the language and has been a primary advocate for the bill. Vineyard Power would like to invite you to celebrate the recent news that our partner, Vineyard Wind, was chosen to build the first large-scale offshore wind farm in the United States. This is a big step towards Vineyard Power's mission to produce electricity from local, renewable resources while advocating for and keeping the benefits within our island community. Monday, June 18th at 4:30-6:30pm. This event will be open to all members, family and friends. Appetizers and drinks will be served. No RSVP is required, just drop by, even for a quick hello! “Vineyard Power Cooperative and Vineyard Wind have built a strong relationship on the principle of delivering value and benefits of renewable energy development to local communities,” said Vineyard Power’s President Richard Andre. “Since signing the nation’s first Community Benefit Agreement for offshore wind development with our organization in 2015, Vineyard Wind has continued to value local relationships while supporting related community-focused renewable energy initiatives such as the Cooperative’s work to develop solar and energy storage projects.” For more information about Vineyard Wind visit www.vineyardwind.com. 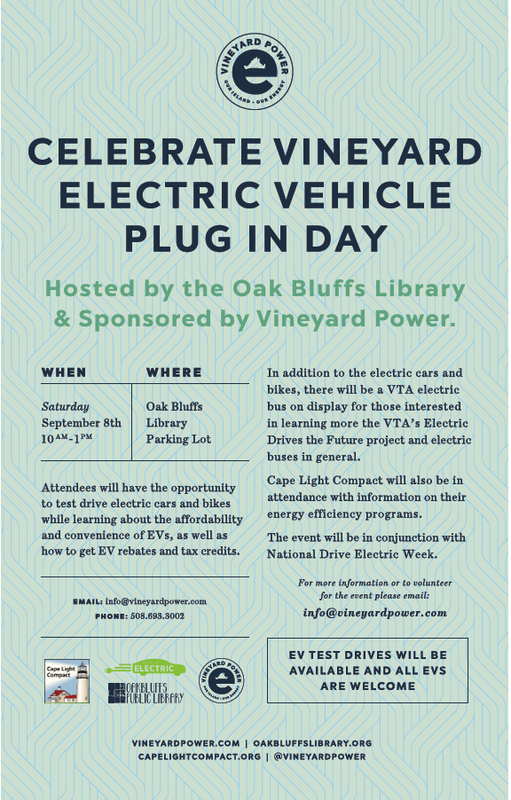 Please help support Vineyard Power & join us Thursday February 8, 2018 at Offshore Ale in Oak Bluffs. Present this ticket and 20% of your food sales will be donated to Vineyard Power. Lots of great silent auction items included as well! To make a reservation please call 508-693-2626. The Massachusetts Environmental Policy Act (MEPA) Office has begun an environmental review of the proposed Vineyard Wind Connector transmission project. The review is yet another step forward for Vineyard Wind’s proposal to construct a large, utility-scale wind energy project off the coast of Massachusetts, with in-state construction to begin in 2019. Vineyard Wind’s accelerated timeline positions the project to become the first commercial large-scale offshore wind farm in the United States, which will soon deliver significant economic development and clean energy benefits to residents and businesses in the Commonwealth. State and local regulatory review of the Vineyard Wind Connector project, a buried and submarine electric transmission project which will provide grid connection for offshore wind turbines located over 14 miles south of Martha's Vineyard and Nantucket, will be undertaken by a number of state and local agencies and boards in addition to the MEPA review. These regulatory reviews and approvals include the Conservation Commission and Planning Boards of the Towns of Barnstable and Yarmouth as well as the Massachusetts Secretary of Energy and Environmental Affairs. The MEPA review process began with public consultative sessions in Boston and Hyannis, as well as a site visit in Barnstable and Yarmouth, on Monday, January 8th. The meetings and site visit follow Vineyard Wind’s filing of an Environmental Notification Form (ENF) and permit application on December 15, 2017. The consultation sessions and site visit conducted by the MEPA office were undertaken to gather public comment and agency input for MEPA’s use in developing a Scope for the Draft Environmental Impact Report (DEIR). The review will include a Mandatory Final Environmental Impact Report (EIR) by Vineyard Wind, and opportunity for public comment to the Final EIR. The proposed Vineyard Wind Connector is comprised of subsea and subsurface electrical transmission lines and a new substation that will connect the Vineyard Wind generation project to the Massachusetts electric grid. The Vineyard Wind offshore wind turbine array, located in the federal waters south of Martha’s Vineyard and approximately 34 miles south of the Cape Cod mainland, calls for a grid connection point to an existing substation in an industrial park in Barnstable with no changes to the existing electrical transmission. Vineyard Wind has stipulated that solid dielectric cables will be buried for their entire length and that transformers and other electrical equipment at the new substation will be underlain by full volume, impervious containment systems. MEPA will accept written comment on the ENF until January 16, 2018. Copies of the ENF are available at public libraries and town government offices in Yarmouth, Barnstable, Mashpee, Martha’s Vineyard and Nantucket. In addition to MEPA review, the Vineyard Wind project will face substantial public review through over 25 federal, state, and local approval processes, including from the US Bureau of Ocean Energy Management (federal Environmental Impact Statement), the Army Corps of Engineers, the Massachusetts Energy Facilities Siting Board, Massachusetts DEP and CZM, the Cape Cod Commission and local conservation commissions. Vineyard Wind also continues to engage in active conversations with the Mashpee Wampanoag tribe. To view the MEPA filing please visit Vineyard Wind's website by clicking here. Click Here to Read the Notice to Mariners & Fishermen. NEW BEDFORD, Mass. (June 23, 2017) – Vineyard Wind, an offshore wind energy developer vying to build the first utility-scale project off the coast of Massachusetts, will host a ribbon cutting and office warming reception at its facility on 700 Pleasant Street in New Bedford. New Bedford Mayor Jon Mitchell, along with State Representatives Antonio Cabral (D-New Bedford), Pat Haddad (D-Somerset), Robert Koczera (D-New Bedford) and Paul Schmid (D-Westport) will join Vineyard Wind to cut the ribbon for the office. When: June 29, 4 to 7 p.m.
Vineyard Wind is one of three companies that has acquired lease rights to build wind projects off the coast of Massachusetts. Vineyard Wind’s project area is about 15 miles south of Martha’s Vineyard. Last summer, Massachusetts required utilities to procure 1,600 megawatts (MW) of clean, offshore wind energy within the next decade. When the 1,600 MW of generation capacity are completed, they will generate enough clean, homegrown energy to power the equivalent of more than 750,000 Massachusetts homes every year. Media planning to attend should RSVP to jlamontagne@rasky.com. Vineyard Wind, a portfolio company of Copenhagen Infrastructure Partners (CIP) and Avangrid Renewables, is an offshore wind development company, based in New Bedford, Mass., that is seeking to build the first large-scale offshore wind energy project in the US.